He told parliament that not only the Sri Lankan rupee but also currencies of most Asian countries had depreciated during the recent past. “Sri Lankan rupee has depreciated by 7.4 per cent while Indian rupee has depreciated by 13.5, Pakistan rupee by 12.1 per cent, Indonesian rupiah by 9.1and Russian ruble by 18.2,” he said. He said the value of the rupee was determined by the foreign exchange market and primary determinants of the demand for currency are import and export of goods and services and added that these basic indicators remained positive in the case of Sri Lanka. “These indicators are moving in the correct direction,” he said. 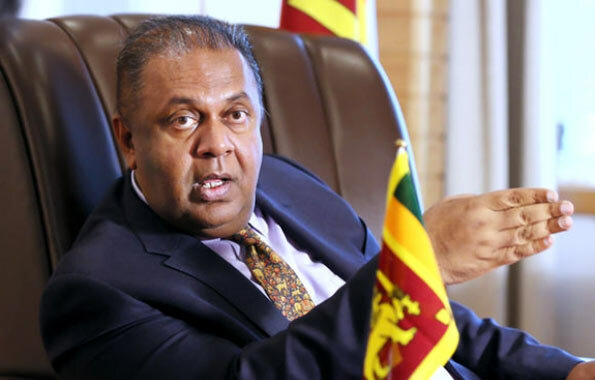 Mr. Samaraweera said in a move to control the outflow of foreign currency, the Central Bank on Wednesday imposed a 100 per cent cash margin requirement for LCs on non commercial vehicles with immediate effect. “There was an influx of vehicles below 1000 cc during the recent past. New cash margin requirement for LCs would reduce the import of vehicles at this juncture. India has imposed regulations on non essential luxury items as well,” he said. He said imposition of minimum tax on vehicles less than 1000 cc and market determinant fuel price formula had been successful in curbing excessive import growth thus far. He said it was wrong to term the depreciation of the rupee as a collapse of the economy. Thank you Hon. Mangala. We had superbarb Finance Ministers. JR, Filix, Ronnie, etc. You are above all of them. You can predict further depreciation of our dear Rupee! You impose Taxes like Mushrooms! Now you touched the humble Sanitary towels use by our woman folks. What ever please do not tax any thing above that Sanitary towel! We men in Sri Lanka protect our assets! There is mangala nor the government could do to to sustain the slr in the global market. Mangala cannot ward off the SLR depreciation beyond 200 ruppes to the dollar. Imagine the prospect of going beyond 200 to maybe 50 then what prospect would there be for the SL exporter! and to what extent the government could subsidise the export industries tea and rubber in particular. Wjat about the health services is people die not out of hunger but ianbility visit the doctor and pay for the gtreatment subsidies to compensate in SLR does not alleviate the pproblems of the sik. so Mangala stop bulshitting about the dpreciation of the SLR impose an austerity program by rationoing petrol and diesle and ban the import of agriucltural produce. B an the export of coconut products and rice. Strict Foregb exchange regulations get private banks to declare the foreign exchnage holdings and FE transction chanelled through the Central bank. These messures are imperative until the balance of payments are resolv ed this may take a few hyears peoplw eople will die of natural causes some will commit sucide because of debt and collapse of their industreis. the sooner the go vernment face the reality the better it is if it is there to serve the people. samaraweera mangal ought to resign if he has any respect for making false declarations.